Late in the fall of 2012, I had the opportunity to stop at Popped!. 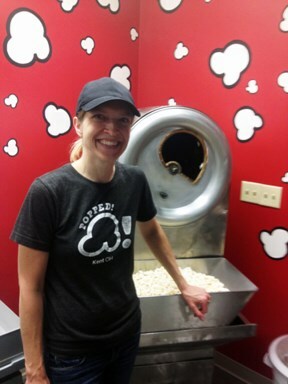 Located within the newly developed Acorn Alley area of Kent, lies the small popcorn shop owned by Gwen Rosenburg who is helped out by her husband, Aaron. As you walk into the unassuming shop, the wonderful aroma of freshly popped Ohio grown corn tantalizes the nose and taste buds. Gwen pops corn with common flavors such as caramel, caramel with peanuts and kettle corn along with unique flavors such as "Firehouse", "Baja" and white cheddar. I ordered a small cone-full with the white cheddar. It tasted as fresh as fresh popped corn could be with a satisfying white cheddar cheese taste. If you pass through the Kent area and are looking for a light snack, you must stop at Popped! Eat up!